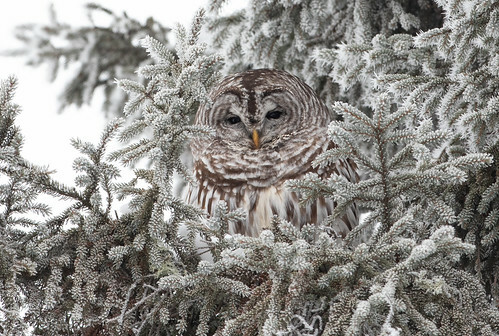 On New Years Day this year, Russ and I made a date—come hell or high water, or even record-breaking low temperatures, we were going to get out birding together on Superb Owl Sunday. We set as our destination the Sax-Zim Bog. 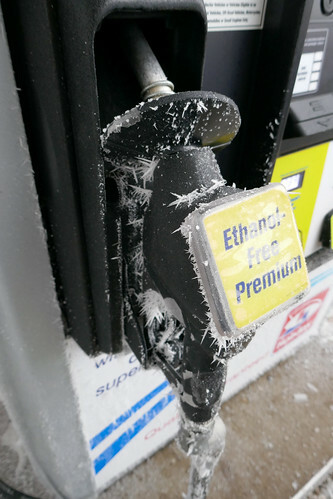 Last Thursday morning, Cotton, Minnesota, in the heart of the bog, had the coldest temperature in the Lower 48, and the fifth coldest temperature ever recorded in Minnesota, 56 below zero. 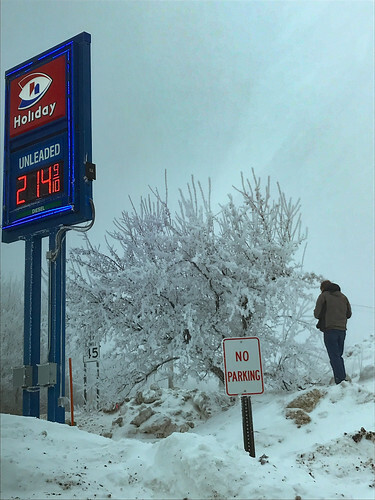 But by Sunday, just three days later, the temperature was 24 degrees—yep, it was an amazing 80 degrees warmer than just a few days before. 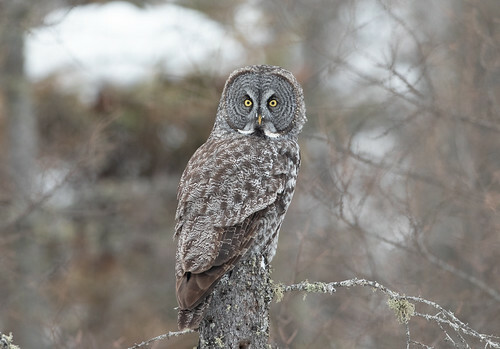 As we drove to the bog, I told Russ I had three goals for the day: to see a shrike, to get some good photos of a Black-backed Woodpecker, and, of course, this being Superb Owl Sunday, to see at least one owl. 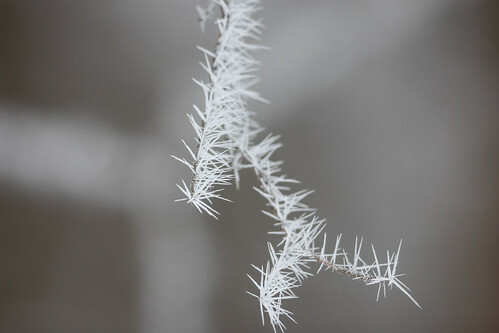 As we drove out of town, there was a beautiful light fog; hoar frost covered all the deciduous trees. 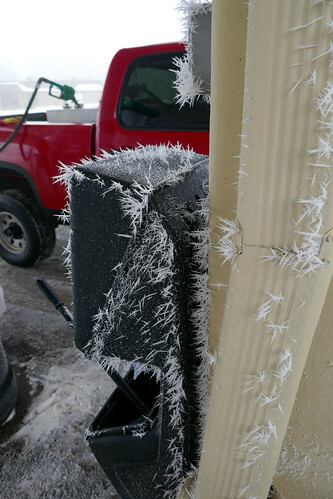 We stopped for gas where frost covered everything—even the gas pumps and garbage cans. Russ took photos—no matter what else happened that day, the stunningly beautiful, needle-like ice crystals gave the morning a special glow. 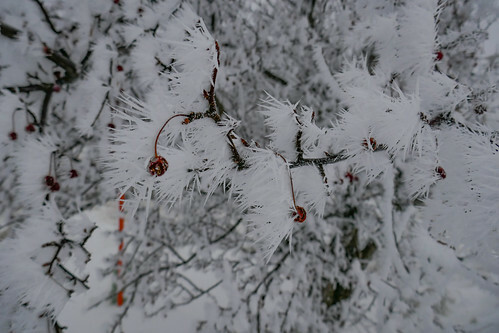 Oddly enough, the fog never lifted all day, the sun never came out, and the temperature never rose higher than that 24 degrees, so for the first time I can remember, the hoar frost never disappeared. 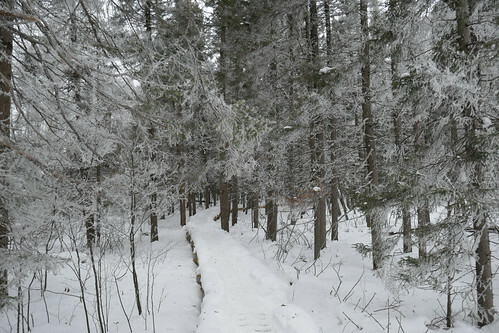 We made our first stop the boardwalk at the Warren Nelson bog—that’s where I hoped to see a Black-backed Woodpecker. No luck on seeing or hearing one, though all the fresh pieces of bark on the ground provided plenty of evidence that they spend a lot of time in this area. Distant crows making a ruckus suggested an owl somewhere, but we never saw where they were mobbing. 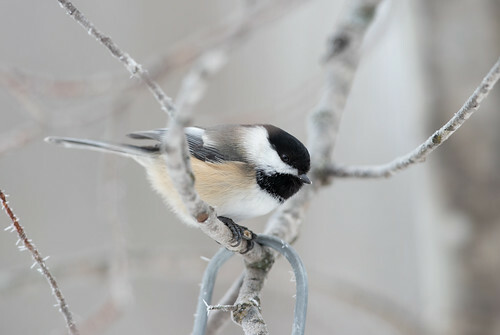 I took some photos of the frost and of chickadees at the feeder. Notice how close Pip sticks to me. She and Russ have to let me go first in case there are any birds. It's the law. 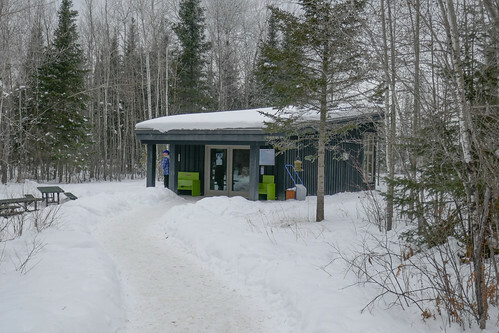 Then we headed to Owl Avenue and the Friends of the Sax-Zim Bog welcome center. 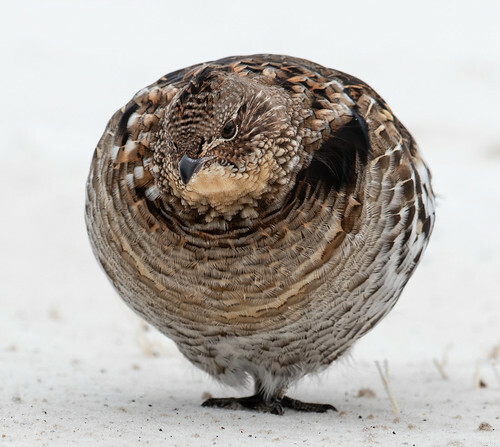 Before we even got there, we slowed down for a dark blob on the road ahead of us—a Ruffed Grouse. A car coming the other way passed by, pulling over enough to avoid hitting it, and the grouse retreated off the road into a ditch. We pulled our car over on the far side to see if it would come out. 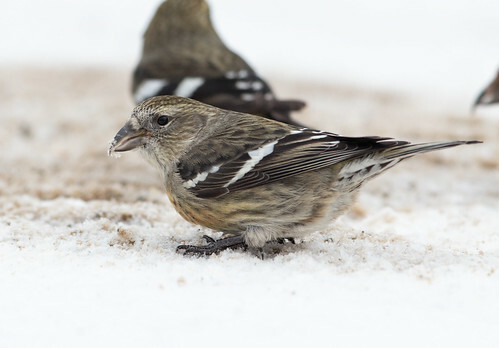 The little guy looked over a snow bank to make sure the coast was clear, and voila! 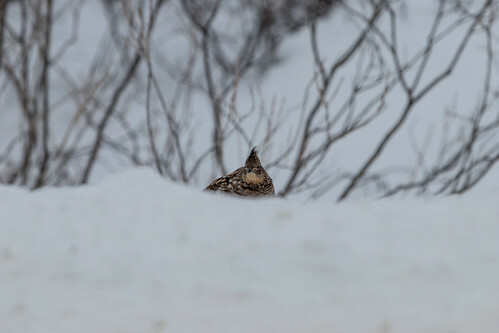 I took some photos of it peering over the snow bank, and then it came closer and closer. 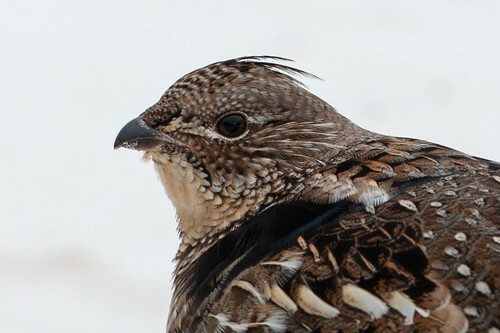 I have never in my life been this close to a Ruffed Grouse and got some amazing closeups. This was not on my list of goals for the day. It was nice to see such a football-shaped bird on the day of the big football game. 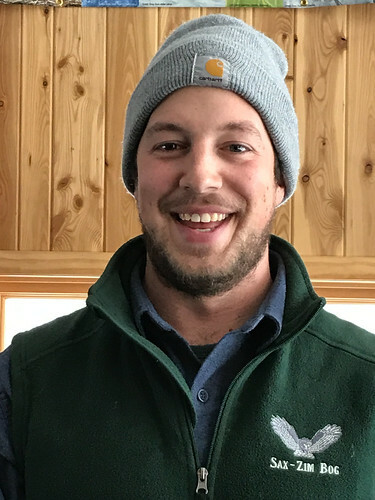 Birders from all over visit the welcome center, keeping the volunteers and staff up to date on where birds are—Clinton Nienhaus told us the best places to go to see Barred, Great Gray, Snowy, and Northern Hawk Owls. 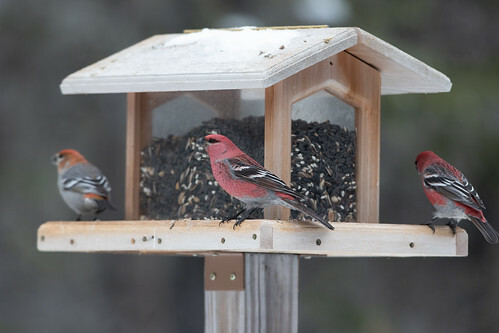 I took photos of feeder birds before we set off. 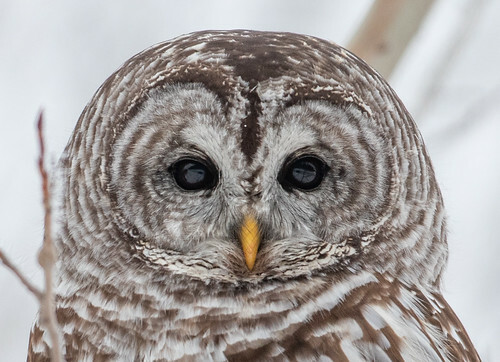 A Barred Owl has been hanging out right at the intersection of Owl Avenue and Arkola. 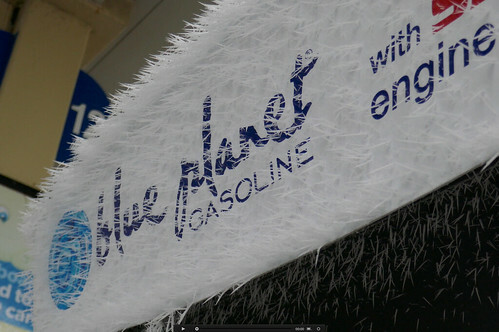 When we got there, a group of people were photographing it, tucked into the branches of a frost-covered spruce. That was a lifer for my dog. 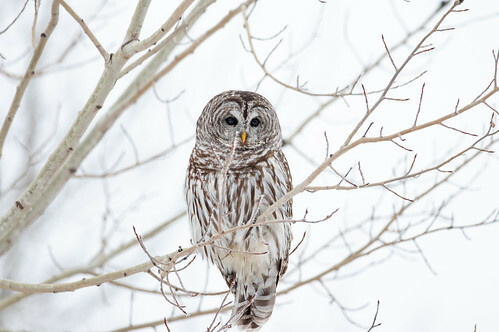 Seeing the owl at all fulfilled one of my goals—getting photos was icing on the cake. 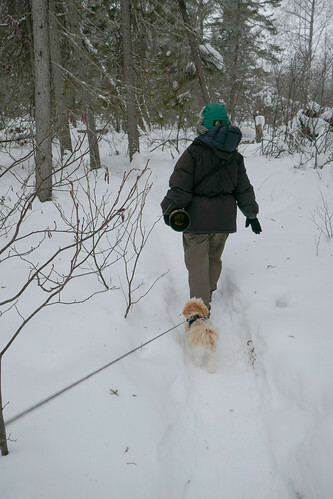 Then we headed to McDavitt Road, where we might find a Great Gray or a Northern Hawk Owl. Before we got to the right spots, we came upon more little blobs in the road, and birders standing right near photographing them. 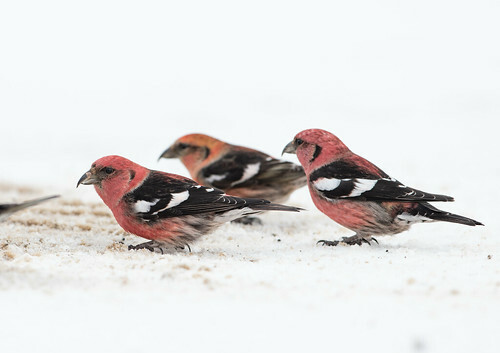 Again I got the best photos I’d ever taken of a species, this time White-winged Crossbills. 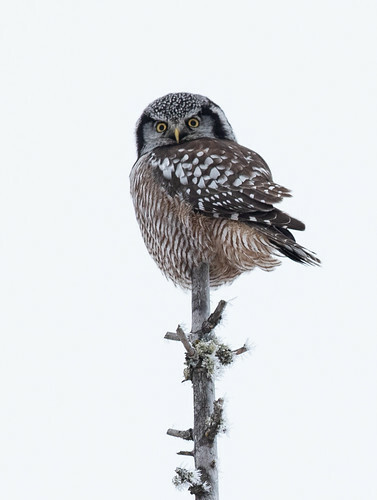 The hawk owl was exactly where people have been seeing it, in a clearing off a little foot trail. My photos against the gray sky were far from my best, but I was thrilled nonetheless. 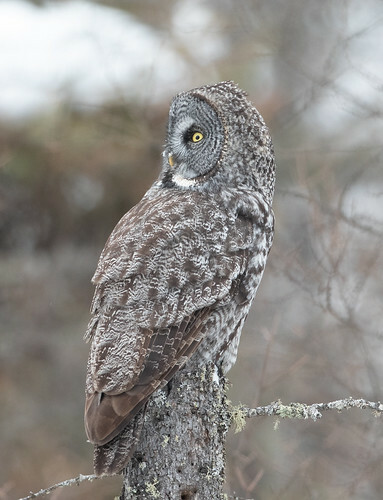 Then we went back to McDavitt to see a group of birders photographing a Great Gray Owl who was perched less than 90 feet away. 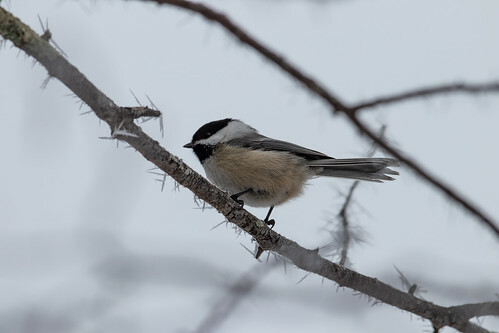 My photos capture the bird and the soft, magical quality to the gray day. It was already getting late. 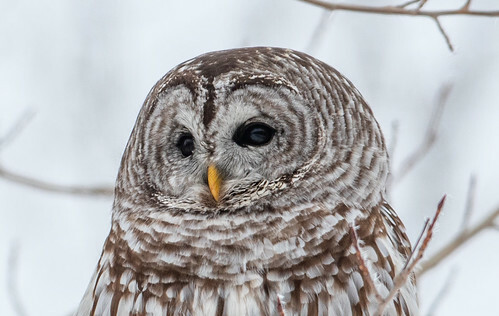 On our way back toward our final goal bird, we passed the Barred Owl corner again. This time the bird was out in a deciduous tree in the open, apparently hunting. We stayed in the car to avoid stressing it, but it was close to the road so my photos show a focal length of only 50 feet. 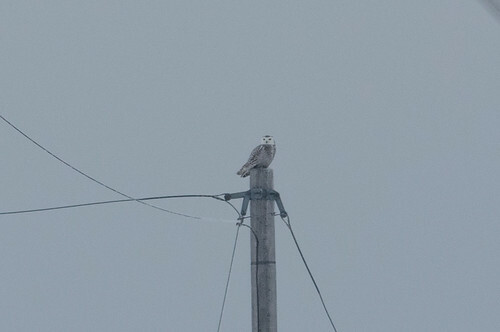 We found one of the two Snowy Owls that have been hanging out in the bog, but it was at least an eighth of a mile away and probably closer to a quarter mile. Russ's and my photos were very gray, but the bird is identifiable. By day’s end, I had achieved only one my three goals, but had fulfilled that one shockingly well—FOUR owls! 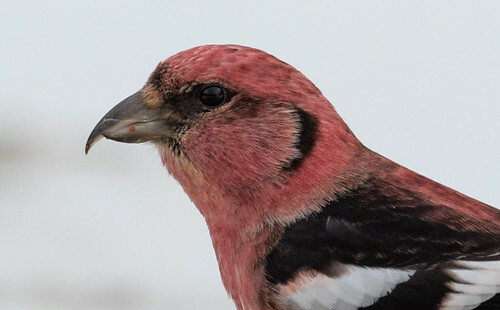 And the other wonderful birds seen made this one of my finest birding days ever. Russ’s and my Superb Owl Sunday turned out to be truly superb. 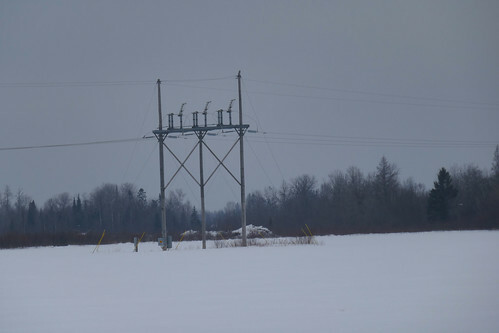 Great photos - don't know if I could have braved that cold but I might have considered it for those 4 owls!